By far the largest rodent occuring in southern Africa and is unmistakable with its protective covering of long quills banded in black and white. The sides, neck, head and underparts are covered in dark, course hair. A crest of long erectile, coarse hairs extends from the top of the head, down the neck and onto the shoulders. This crest is only raised when the animal is alarmed or angry. The head and snout are broad, with small eyes and short, rounded ears. The legs are short and stout, with heavily clawed feet. Quills are easily detached and are frequently found lying on trails and pathways. The tail is short and carries a number of hollow, open-ended quills which act as warning rattles when vibrated together. Wide range but preference for more broken country. 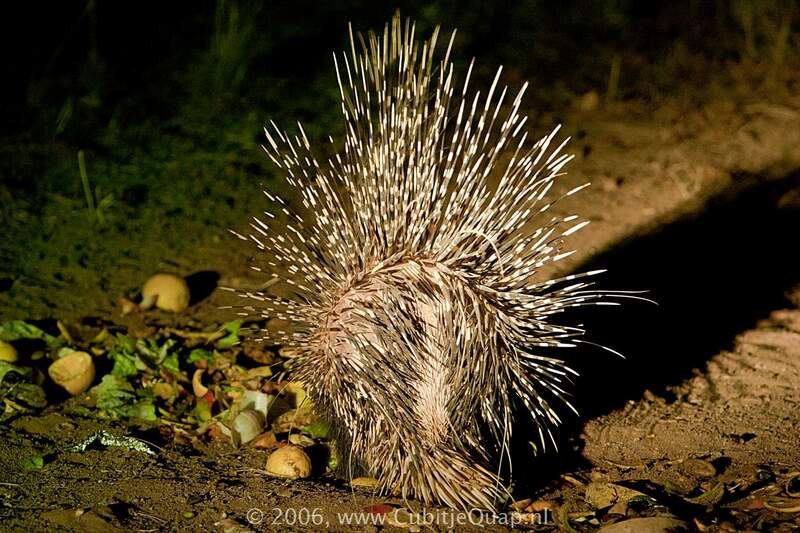 Solitary porcupines are more commonly seen but pairs and family parties will also be encountered. It is nocturnal and during the day it lies up in caves, amongst rock, in burrows (either its own or those of other species) or even amongst dense vegetation. A common feature of well-used porcupine shelter is the accumulation of gnawed bones. It is generally believed that porcupined gnaw these bones both for their mineral content and to sharpen the long incisors. Within its home range a porcupine makes use of regular pathways, along which are numerous shallow excavations exposing plant roots and bulbs. 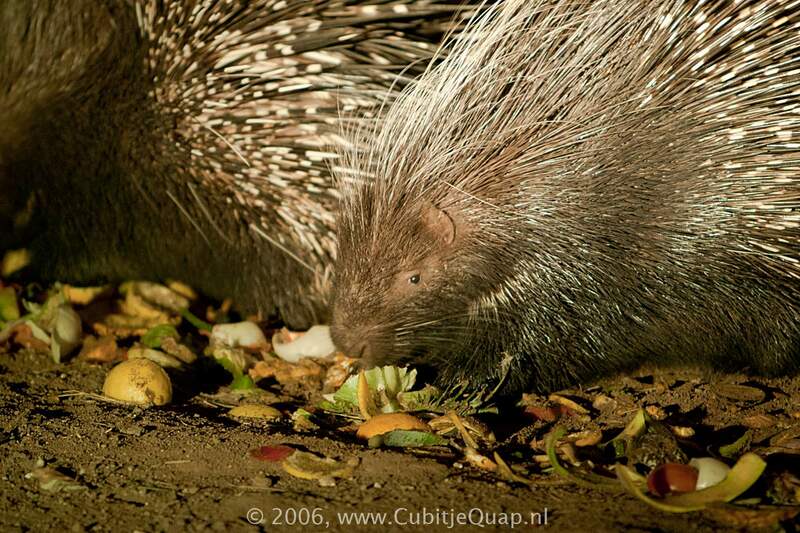 Although several porcupines may share a shelter, foraging is usually a solitary activity. Roots, bulbs, tubers and the bark of trees, as well as a number of cultivated crops such as potatoes and pumpkins. It has also been recorded as eating from animal carcasses; it is often, in fact, caught in traps baited with meat originally set to catch carnivores.